Mephisto is the title of a 1981 film adaptation of Klaus Mann's novel Mephisto, directed by István Szabó, and starring Klaus Maria Brandauer as Hendrik Höfgen. The film was a co-production between companies in West Germany, Hungary and Austria. The film adapts the story of Mephistopheles and Doctor Faustus by having the main character Hendrik Höfgen abandon his conscience, continue to act and ingratiate himself with the Nazi Party, to keep and improve his job and social position. Hendrik Höfgen (Klaus Maria Brandauer) craves center stage. The first third of the film follows the frustrated, passionate actor slogging it out in provincial theaters, occasionally dancing and singing and doing parts in films to progress his career. He even creates a Bolshevik theatre with a friend for more work, in the avant-garde period of the early 1930s, before the Nazis came to power. Hendrik is more successful in his social and love life. Both strands unite when his new wife watches him play the ultimate part Mephisto (the devil in the Faustus play) just before the Nazi party win the election that brings them to power. While his wife, leading actors, and friends leave Germany or protest against the new regime Hendrik returns to Germany lured by the promise of forgiveness for his Bolshevik theatre escapade and a desire to act in his native language. So when the Nazi party effectively offers to make him a star he doesn't hesitate. Great roles and plenty of praise accumulate quickly, and Hendrik revels in his success. Hendrik reprises his great Mephisto and agrees to run the national theatre, working around the cultural restrictions and brutality of the Nazi Regime. He blithely overlooks the profound moral compromises of his situation, excusing himself by using the power of his close Nazi relationships to help friends who would otherwise be targets of the regime. 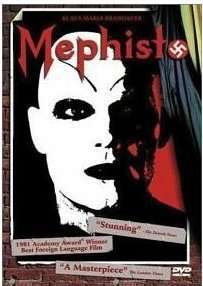 The plot's bitter irony is that the protagonist's fondest dream is to be Germany's greatest actor playing Hamlet and Mephisto but to achieve this dream he sells his soul and realises too late that he is not playing the Mephisto but the Faustus role; it is the Nazi leader having a major role in the film (modeled on Hermann Göring) who is the real Mephisto. Mephisto was awarded the 1981 Academy Award for Best Foreign Language Film; the film was submitted to the Academy by Hungary. It was the first Hungarian film to win the Foreign Language Oscar, and the only one until Son of Saul won in 2016. At the 1981 Cannes Film Festival the film won the Best Screenplay Award and the FIPRESCI Prize. It received the award for Best Foreign Language Film in 1982 by the U.S. National Board of Review of Motion Pictures. ↑ "The 54th Academy Awards (1982) Nominees and Winners". oscars.org. Retrieved 2013-06-15. ↑ "Festival de Cannes: Mephisto". festival-cannes.com. Retrieved 2009-05-31. ↑ "1982 Award Winners". National Board of Review of Motion Pictures. 2016. Retrieved 11 November 2016.